Herbet, IV, 1900, 303 (1969, 153), VI (Petits Cartouches), 3. COLLECTIONS: Amsterdam (De Jong and de Groot, 1988, 226, 542.3). New York, 62.525, no. 9. LITERATURE: Zerner, in EdF, 1972, 269, under no. 317. 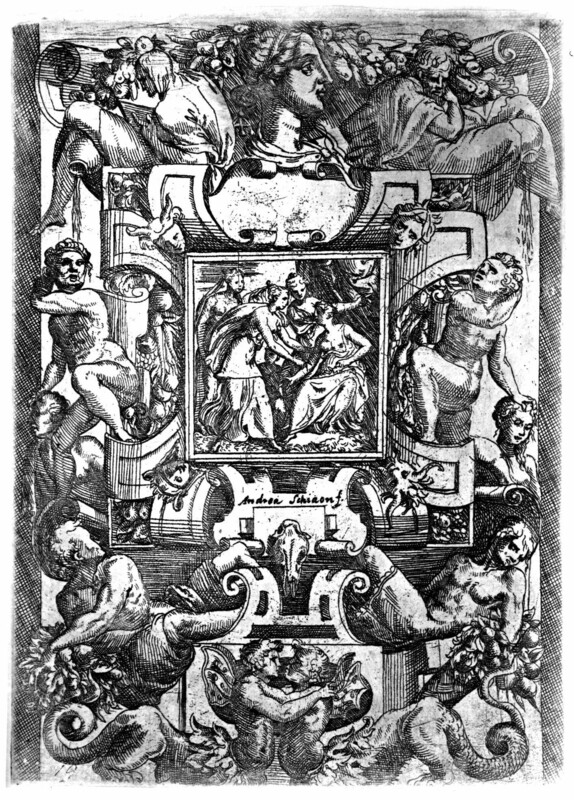 This print is copied, with small variations, from an etching by Fantuzzi that could be based on a drawing by Rosso; see E.86 (Fig.E.86). It is also related to Du Cerceau’s Grand Cartouches, Second Set, 2 (E.56,2). DERIVATION: Moro. Cartouche with two heavily draped slouching figures above a small square scene of three standing women and one seated. Etching and drypoint, 17.8 x 13.1 S (Vienna). Bartsch, XVI, 1818, 85, 19, as Schiavone. Herbet, IV, 1900, 301 (1969, 151), under Du Cerceau, V (Grands Cartouches, Second Set), 2, and 303 (1969, 153), under Du Cerceau, VI (Petits Cartouches), 3. COLLECTIONS: London (State I). Vienna, Vol. It.III.2, p.7, top, State II, inscribed below central scene: Andrea Schiaon f. (Fig.E.57,2, Moro). LITERATURE: Kusenberg, 1931, 166. Zerner, in EdF, 1972, 269, under no. 317. Zerner, IB, 32, 1979, 130 (London), as Pittoni? De Jong and de Groot, 1988, under 542.3, as Pittoni. 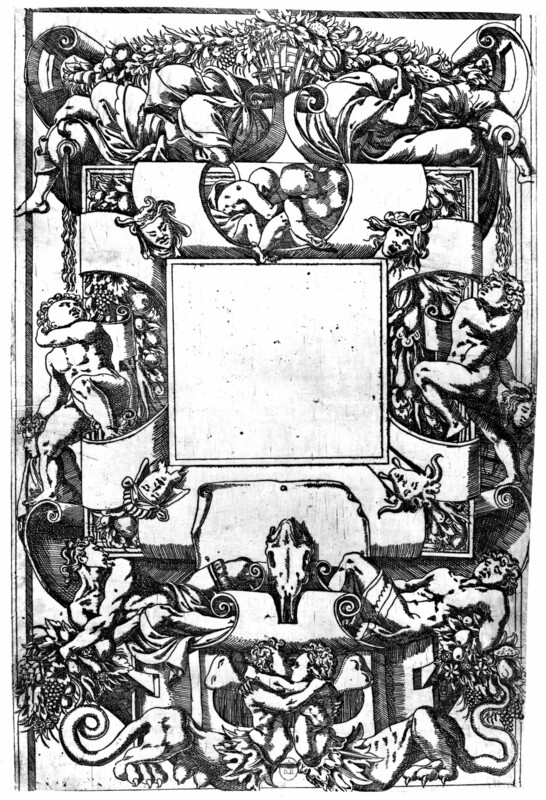 Moro has added a large profile head at the top, eliminated two seated putti, and added the scene in the center. Otherwise, his print rather closely follows Du Cerceau’s model.